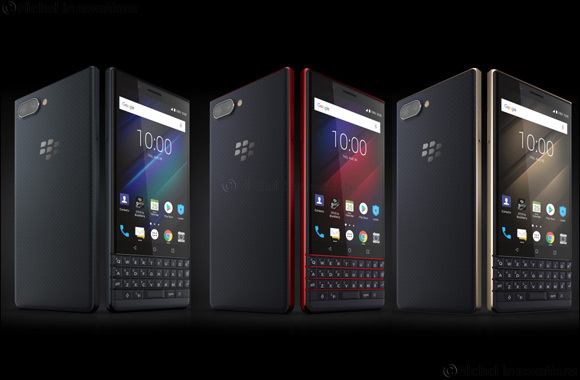 Dubai, UAE, September 01, 2018: TCL Communication, a leading global smartphone manufacturer and BlackBerry®-branded licensing partner, has today unveiled its newest BlackBerry smartphone – the BlackBerry KEY2 LE. This newest addition to the BlackBerry KEY series smartphone lineup offers three colors variants – Slate, Champagne and Atomic – while keeping with the BlackBerry KEY2 design evolution which includes minimized screen bezels and redesigned chassis for a more modern look and feel. It also comes with the recently introduced Speed Key for a more customized universal shortcut experience, and in addition to its Android™ operating system, includes support for popular features like the Google™ Assistant, Google™ Lens and Google Pay™. The BlackBerry KEY2 LE will be available for purchase in markets globally - including Germany, the U.K., France, UAE, Canada and the U.S. - beginning next month with the suggested retail price starting at $399 USD / €399 EUR / £349 GBP / $519 CAD for the 32GB storage variant and $449 USD / €429 EUR / £399 GBP / $579CAD for the 64GB storage variant. Delivering the power and performance expected from a BlackBerry smartphone, the BlackBerry KEY2 LE comes with 4GB of memory and in both 32GB and 64GB storage variants – with both offering expandable storage MicroSD support. It is powered by a Qualcomm® Snapdragon™ processor and an efficient battery that offers up to 22 hours of mixed use to get you through the busiest of days and often into the next day. In addition, the BlackBerry KEY2 LE features Qualcomm Quick Charge® 3.0, enabling up to a 50 percent charge in about 36 minutes – enough power to get you through a normal work day. The BlackBerry KEY2 LE also comes with a Boost mode charging and contextual battery reminder which will learn from your daily charging habits and calendar appointments to recommend when to charge so you have the battery power you need when you need it most.